I love that I have had the opportunity to be a part of many home tours over the years because our real holidays do not get documented. When you have company over, you are rotating what goes in the oven and you are talking with your favorite people and there is little time for picture taking. I do love preparing for the gathering though. 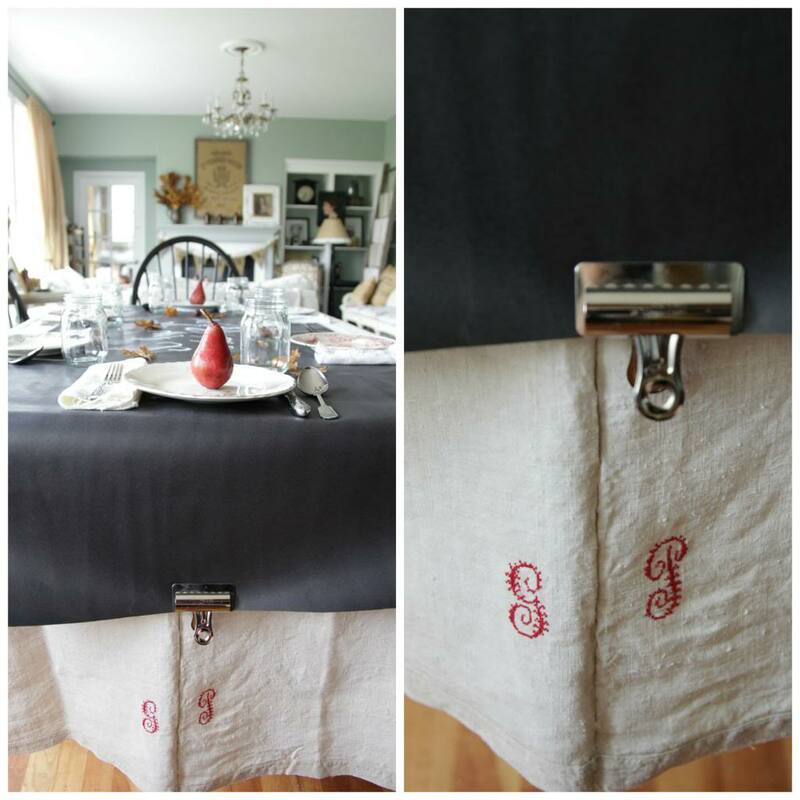 It is a part of my creativity and simple tablescapes are so fun to do. I usually prepare them the night before the holiday meal so once everyone gets to our home all of my attention is on them and the meal. 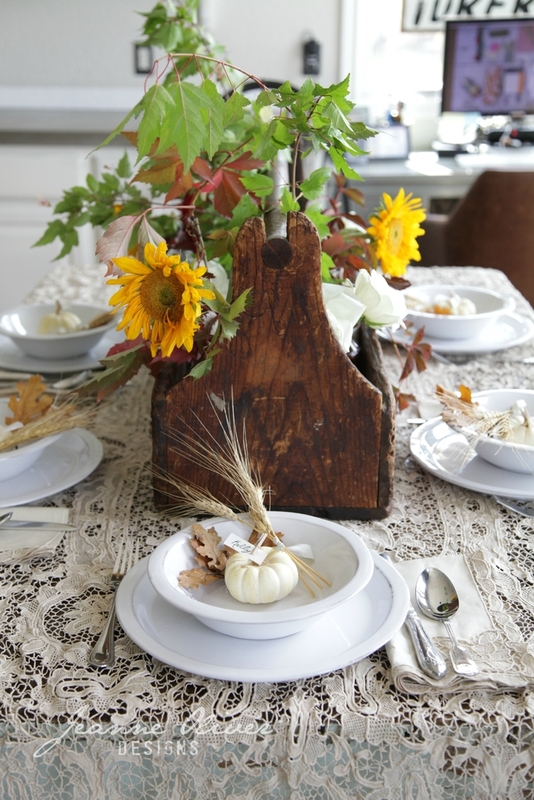 Here are some recent and also some older fall tablescapes if you love creating them as much as I do. If looking at any stylized gathering makes you want to run to Outback and order your Thanksgiving meal then please skip this whole post. If you want to create something this holiday but don’t know where to begin then continue to scroll down and maybe the photos will help you come up with your own ideas. If tablescapes are your jam and you begin preparing months in advance I can promise you that mine may not be your thing. 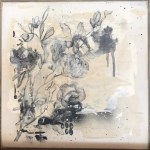 I pull from our cabinets, I rarely spend anything beyond unscented candles and flowers, I last minute forage for greenery or branches in our yard and I may be wiping dust off our dishes last minute as people are coming through the door. That last part should have been kept secret. 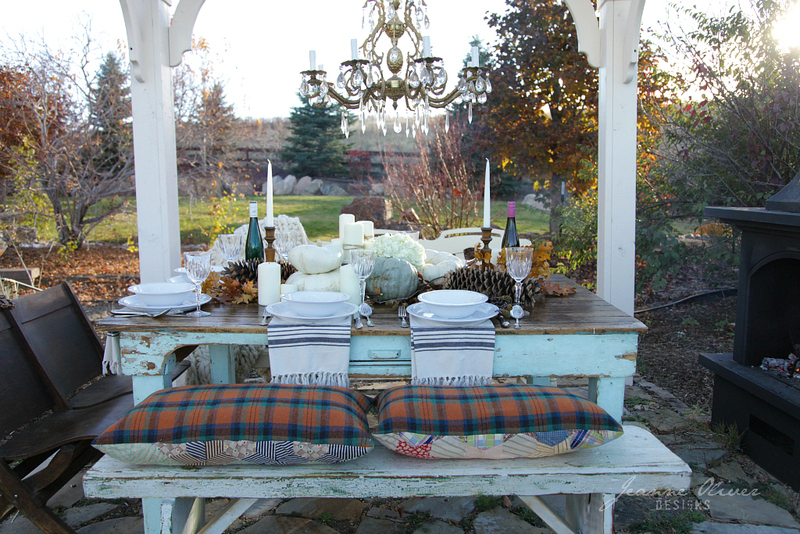 If you are still reading then I would like to first thank you and now share some past and present fall tablescapes. 1. 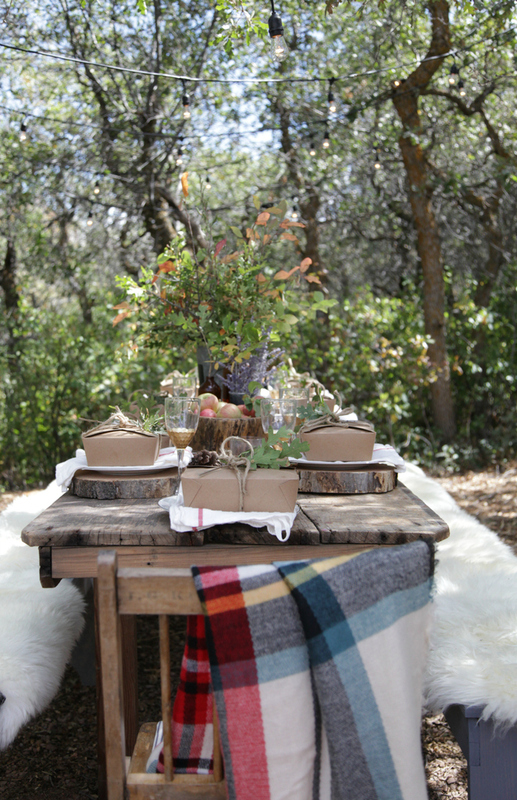 This is my most recent fall tablescape and it is one of my favorites because it was on our new land, it was for a bunch of women at one of our workshops and the natural elements just makes it so lovely and relaxing at the same time. Talk about how to take boxed sandwiches to the next level. It was so fun and the women felt so special (exactly how we wanted them to feel). 2. Another outdoor favorite. This is the from last fall in our previous home. 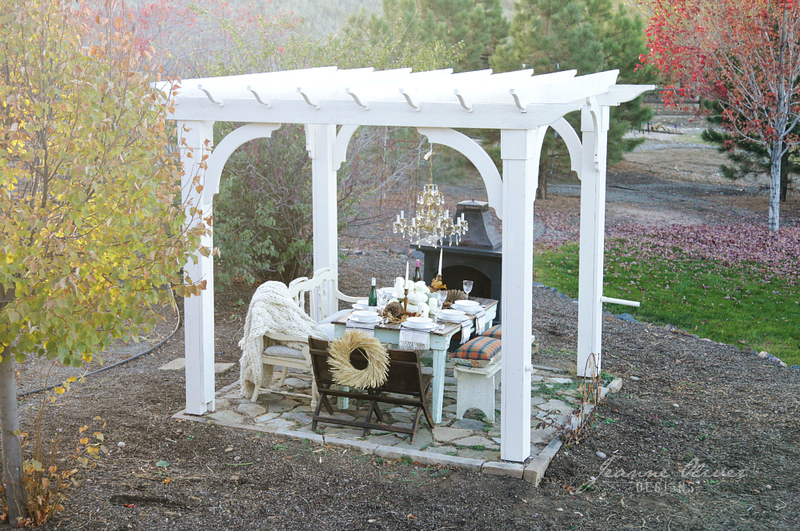 My husband built this pergola and this yard was a constant labor of love to try to make a subdivision yard feel soft and organic. We were far from finished when we moved but I loved this yard and all of the parties, movie nights, snowmen and years playing on the swing and sandbox. This house will always be special because it is the house that helped me to find my creative passions and it loved us well. 3. If you have been reading this blog for a LONG TIME you will remember when our business was A Bushel and a Peck. My mom would sing that song to us when we were little and I then sang it to our children. I had no idea how our business would grow over the years but this song still holds a special place in my heart. 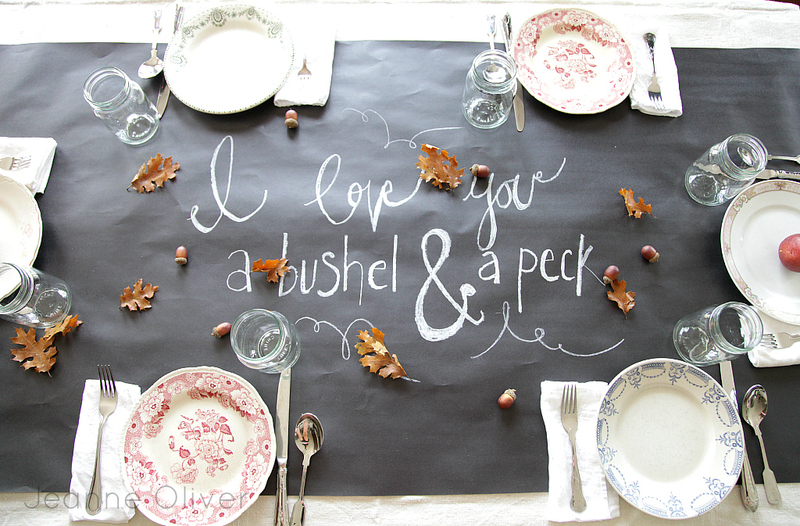 This tablescape was based upon those memories and that song. 4. 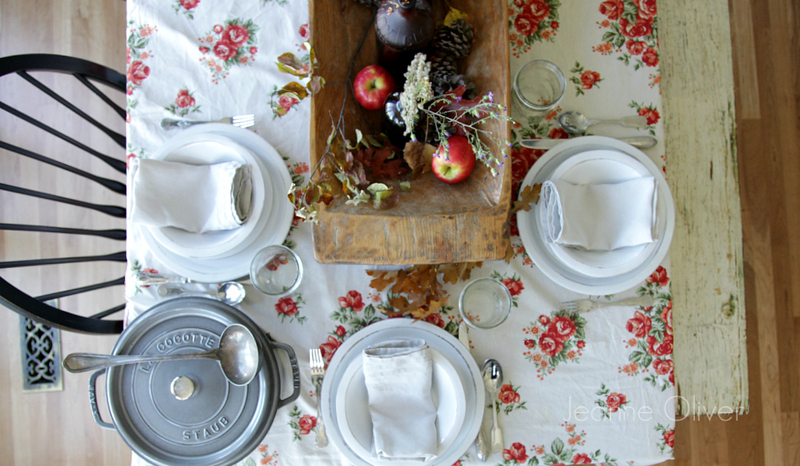 Sometimes you just need a vintage floral tablecloth, foraged treasures as your centerpiece and a big pot of something yummy. Don’t over think it. 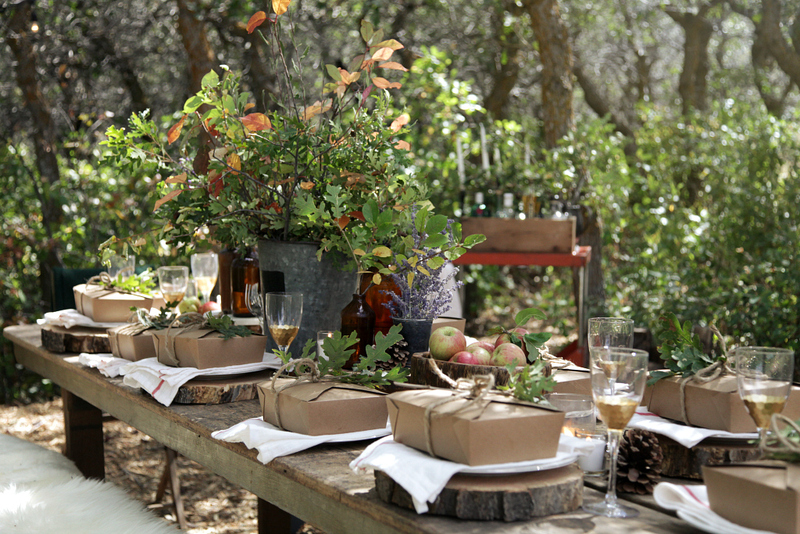 Have fun with what you have and make your guests the main attraction. 5. Getting old treasures is the best for mixing up your style and decorating. 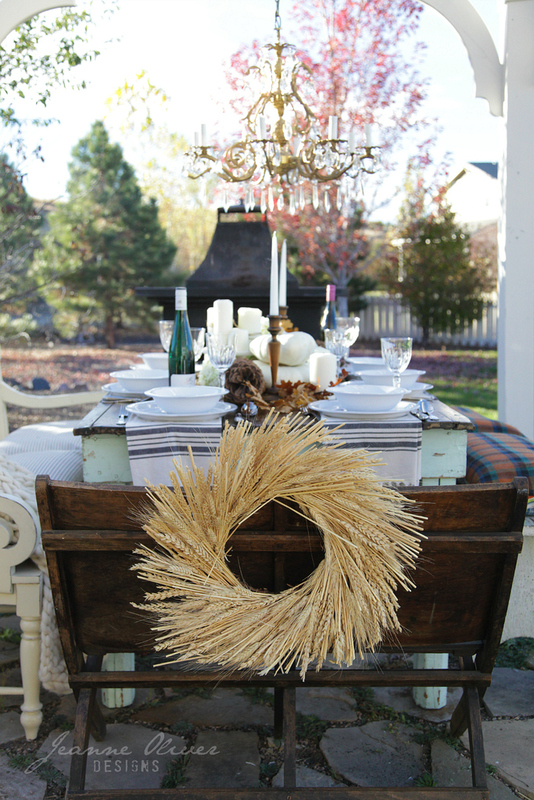 This tablescape was created from vintage linens my mom found and passed on to me. It is completely different than what I would normally use or buy and I think it brought a sweet elegance to the table. 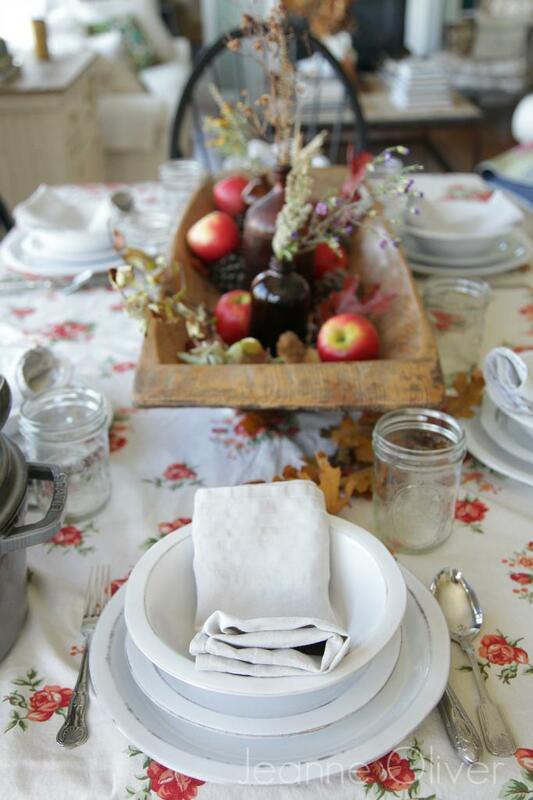 Just think about how many meals have been placed upon this lace tablecloth and how many laps these napkins graced. I love the stories that vintage treasures tell. 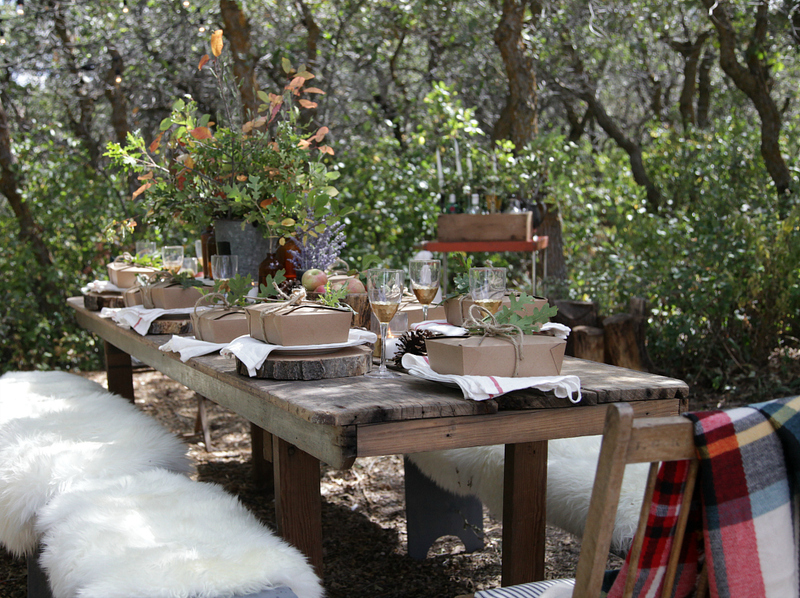 Thank you for joining me and HAVE FUN putting together your Thanksgiving table! 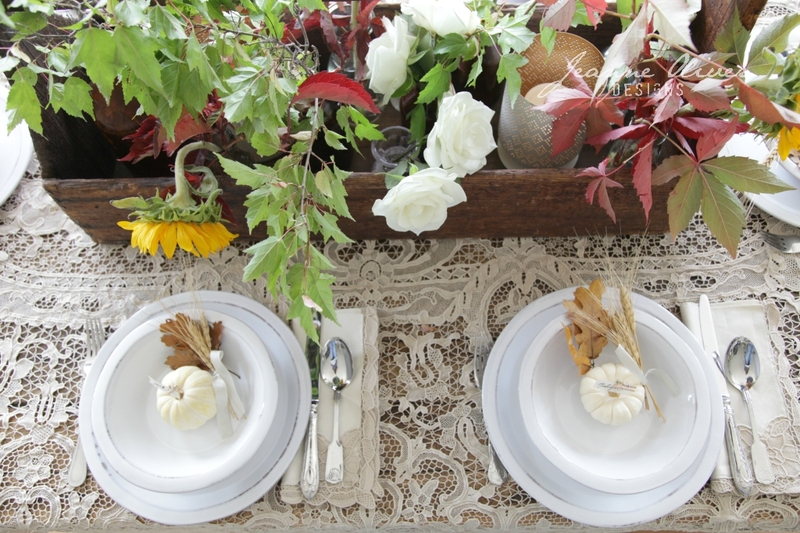 Jeanne, I love all these tablescapes . . . what simple yet cozy designs. You have me thinking now. I’m going to rummage through my cabinets to see what I can find. In our family we’ve transitioned from having the whole tribe over to my house, to going to one of my daughter-in-law’s house for the big celebration. So today I’m baking all the pies (5 regular pies and one big slab apple) and I’m making the dinner rolls. I’m having fun and there’s flour everywhere. You gave me the idea to tuck decorations in the delivery boxes for all the goodies. Since I don’t have to decorate a table now, I can decorate the baskets and boxes I use for transporting. That will be fun — thanks for the inspiration. Have a blessed Thanksgiving and thanks for all you do.